YOUNG JUSTICE Season 3: How Will KID FLASH Return? The "fallen" can only be referring to Kid Flash, a.k.a. Wally West, who vanished into the Speed Force in the last episode of the original Young Justice. But how will the show bring Wally back? As always, we look to the comics for clues, where Wally West has been lost, and come back, from the Speed Force more than once. The first time Flash Wally West vanished into the Speed Force was shortly after he discovered its existence, during the events of the storyline "Terminal Velocity." In that story, he learned that his girlfriend Linda Park was going to die at the hands of the terrorist Kobra, and he did everything he could to prevent that future from happening. To do so, he had to go at speeds way beyond light to save Linda's life, and as a consequence he entered the Speed Force for the first time, seemingly giving up his life to save hers. However, he managed to return, despite what other speedsters had said about it being impossible. He learned it was his love for Linda that was his tether from the Speed Force to the real world. In the Young Justice series, Wally isn't dating Linda Park, but fellow team member Artemis. Could his love for his heroic girlfriend be the things that eventually pulls Wally back into the real world? The second time that Wally disappeared into the Speed Force was at the end of the 2005 DC Comics event series Infinite Crisis. 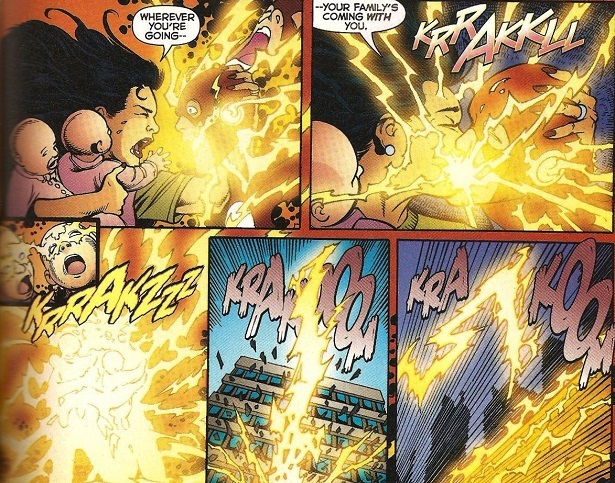 During the climax of the event, Kid Flash (Bart Allen) and several speedsters were able to temporarily subdue the villainous Superboy-Prime by sending him to the Speed Force. Wally West, his wife Linda, and their newborn twins Jai and Iris eventually followed them into the Speed Force, and vanished from the Earth. While there, they decided to absorb the Speed Force into Bart and send him home to battle an escaped Superboy-Prime. Wally and his family vanished for a year, and Bart Allen emerged older and ready to take on the mantle of the Flash, in the pages of the new Flash #1. Needless to say, fans of Wally West were not happy with Bart as Flash. Within a year, Bart Allen was killed, and Wally and his family returned from the Speed Force, with Wally ready to take on the mantle of the Flash again. Wally's Flash comic resumed with the old numbering. Bart Allen eventually returned to life, came back a teenager again and returned to the role of Kid Flash, and everyone pretended his tenure as the Fastest Man Alive was just a bad dream. When Wally returns from the Speed Force, there is a good chance he'll return much older, similarly to how the comics' Wally came back with two pre-teen children, who were infants when he went in. If that's the case, expect him to ditch the Kid Flash persona for good, and become the new Flash, even if Barry Allen still uses that name on the show. The comics have proven there is room for more than one hero to be named the Flash. Despite Wally West's popularity, DC has always underestimated how beloved he is by the fans. When DC rebooted their universe with the New 52 back in 2011, many characters got 21st century upgrades -- but Wally West was nowhere to be found. It seemed, in fact, that he never even existed in this newer, younger DCU, which sent most Flash fans into a tizzy. Eventually, DC gave fans an all new Wally, who was a young African-American teenager, who would become the new Kid Flash. While fans applauded DC becoming more diverse with the new Wally, it simply wasn't the Wally we had grown up with, who had been Kid Flash and grown up to assume the Flash mantle. The cries for classic Wally West to return never died down. With DC Rebirth in 2016, fans finally got their wish, and the original, adult Wally returned. It turned out, after the events of Flashpoint, which led to the New 52, Flash villain Abra Kadabra used the upheaval of the timeline change, and erased Wally from history and made everyone forget about him. Wally once again became stuck in the Speed Force, and he tried to break free by finding a loved one who would still remember him, and after several unsuccessful attempts to contact his friends and family (including his wife Linda), Barry Allen recognized him and returned him to life. After a tearful reunion with his mentor, Wally became the Flash again, with an all-new costume. Oh, and the new younger Wally? He is still around. It was revealed that he's not some alternate universe version of the Wally West we knew at all, but a younger cousin of the original Wally's, who is named after the same relative. DC let fans have their cake and eat it too. It could be that the Young Justice version of Wally West has a similar effect on the world when he vanished into the Speed Force, and the world slowly forgets his existence. He might need to rely on the memories of his friends and teammates to be able to break free and come back to Earth. Are you excited for the return of Young Justice and Kid Flash to the airwaves? Let us know down below in the comments.